Though the Kilobots are low-cost, they maintain abilities similar to other collective robots. These abilities include differential drive locomotion, on-board computation power, neighbor-to-neighbor communication, neighbor-to-neighbor distance sensing, and ambient light sensing. Additionally they are designed to operate such that no robot requires any individual attention by a human operator. This makes controlling a group of Kilobots easy, whether there are 10 or 1000 in the group. Easy to manipulate, with the Kilobot controller you can program and control hundreds of Kilobot at one time. 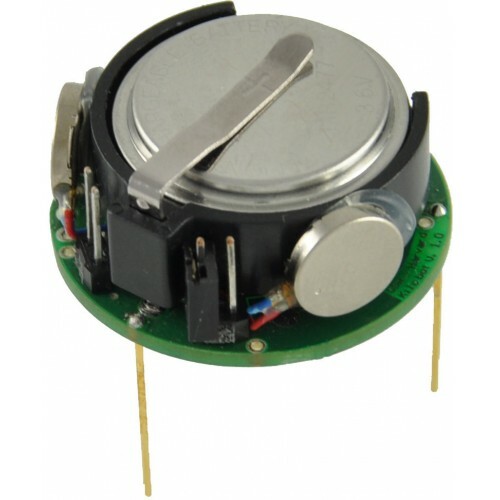 Rechargeable Li-Ion 3.7V, for a 3 months autonomy in sleep mode. Kilobots can communicate with neighbors up to 7 cm away by reflecting infrared (IR) light off the ground surface. When receiving a message, distance to the transmitting Kilobot can be determined using received signal strength. The brightness of the ambient light shining on a Kilobot can be detected. Each Kilobot has 2 vibration motors, which are independently controllable, allowing for differential drive of the robot. Each motor can be set to 255 different power levels. Each Kilobot has a red/green/blue (RGB) LED pointed upward, and each color has 3 levels of brightness control. The Kilobot Controller software is available for controlling the controller board, sending program files to the robots and controlling them. For programming, the open source development software WinAVR combinated with AvrStudio from Amtel gives a C programming enviromnent. An API with basic functions such as motor speed, led control, distance measurement,... is available and some examples are provided. A serial output header is available on each robot for debugging via computer terminal. 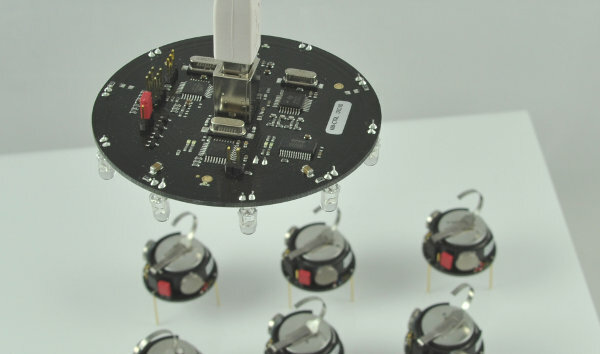 The Kilobot controller board with the controller software can manage a large amount of robots at one time. send a new program to all Kilobots at once. This action can be done for every Kilobot in an one-meter diameter area below the controller. The Kilobot controller can program an individual Kilobot using the built-in ISP programmer. It can also connect to an individual Kilobot's serial output header so it can be displayed on a windows computer. The Kilobot charger is a very usefull tool allowing you to charge up to 10 Kilobots at one time. You just have to place each Kilobot between in contact of the charger.